WILLIAMSPORT, Pa. - Coming off a dramatic win on the road, the Lycoming College football team returns to David Person Field on Saturday, Sept. 30, looking for its second straight win as it hosts Wilkes in Middle Atlantic Conference action. The Warriors (1-3 overall, 1-2 MAC) notched a 44-41 win over King's in their last outing, as senior Chase Williamsscored on an 11-yard run with 41.7 seconds left to secure the win. Williams also tossed for 337 yards and three touchdowns in the win. The Colonels (0-4 overall, 0-3 MAC) fell, 43-14, in its last outing to Misericordia. Freshman quarterback Wade Rippeon finished 32-for-51 for 269 yards and one touchdown to lead the team. • Senior Chase Williams was named the MAC Offensive Player of the Week after his 406 yards of total offense against King's, the fifth-most in program history. • Sophomore Jamie Fisher leads the MAC and is eighth in Division III with seven field goals made. • Fisher tied the school record with three made field goals against King's, as he hit from 40, 25 and 36 yards. • Juniors Nick Costello (104) and Brock Zollicoffer (108) became the first pair of receivers to each post 100 yards since 1996. • Junior Ahmad Curtis' interception return for a touchdown against King's was the team's first defensive touchdown since Oct. 3, 2015. • Junior Sam Romanofsky's 3.5 sacks are second in the MAC. After quadrupling his season yards per game average against King's and rushing for the game-winning touchdown with less than a minute left, senior Chase Williams earned his first career Middle Atlantic Conference Offensive Player of the Week award. Williams entered the game averaging just 81.0 yards per game passing and 12.3 yards rushing before accounting for 406 of Lycoming's 492 yards and all four offensive touchdowns, including the game-winning touchdown run with 41.7 seconds left in a 44-41 win over King's. Williams capped a 10-play, 71-yard game-winning drive with an 11-yard touchdown off a draw to give Lycoming its first win of the season. The senior finished the day with eight rushes on the ground for 69 yards and a touchdown. Through the air, Williams was 25-of-44 for 337 yards and three touchdowns. He threw touchdown passes of 53, three and 34 yards in game. His 406 yards of total offense is the fifth-best performance in school history. He also finished 10th in school history with 25 completions and 12th with 337 yards passing. The Warriors had two wide receivers go over 100 yards for the first time since 1996 in the 44-41 win over King's, as junior Nick Costello caught eight passes for 104 yards and a touchdown and junior Brock Zollicoffer caught five passes for 108 yards and two touchdowns. In addition, sophomore Dante Gipsonadded six catches for 92 yards. The last time the Warriors had two 100-yard receivers was on Oct. 26, 1996, when the team downed Widener, 37-31, as Tom Ralicke (149) and Steve Verton (169) eclipsed the century mark. Sophomore Jamie Fisher stepped into the team's field goal kicking role and he has connected on all seven of his attempts this year. Against King's, he had a breakout performance, tying the school record of three made field goals in a game, connecting from 40, 25 and 36 yards. He also booted six touchbacks and averaged 62 yards on nine kickoffs. Earlier this season, Fisher hit a 43-yarder against Delaware Valley, which is tied for the seventh-longest field goal in program history. He is just the third kicker in school history to hit two 40-yard field goals in a season, joining Rusty Fricke (1984, 56, 52) and Porfirio Goncalves (1971, 46, 43).The Ridley, Pa., native leads the conference and is eighth nationally with his average of 1.8 field goals per game. Junior Ahmad Curtis became the first Warrior defender to score points in the 2017 season, as he intercepted a tipped pass and returned it 21 yards for a touchdown in the third quarter of Lycoming's 44-41 win over King's. The 6-1, 320-pounder was the first Warrior to post a pick-six since Tyler Smith had one against Wilkes on Sept. 19, 2015. 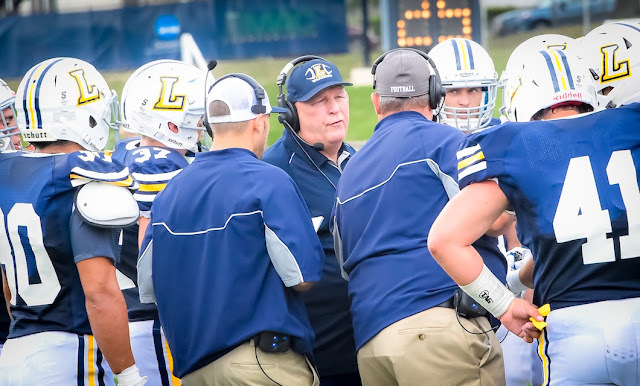 Lycoming's 44 points at King's marked the 16th time in head coach Mike Clark's 10-year tenure that the team crossed the 40-point mark. The Warriors are 15-1 in those games. It was Lycoming's first 40-point effort since a 43-42 win over Delaware Valley on Nov. 7. 2015 and the team's 492 yards of total offense the most since it had 552 in a 38-14 win over Misericordia on Nov. 14, 2015. Junior Sam Romanofsky is second in the MAC with his 0.88 sacks per game through the first four games of the year. The Havertown, Pa., native has 3.5 sacks on the year, as he posted 2.0 sacks on two assisted sacks and one solo effort against King's. He is the first Warrior to post two sacks in a game since Jon Rummel had two at Susquehanna on Sept. 5, 2015. Contact Mr. MAC: mail@MACfb.com About MAC Football News: MAC Football News is the unofficial site for DIII Middle Atlantic Conference Football News. Our mission is to promote MAC Football and maintain an environment for discussion, analysis and fun while highlighting our great football players and programs. About Amazon's Echo: Have an Amazon Echo? Enable the Skill “MAC Football News” to get the latest MAC Headline News. 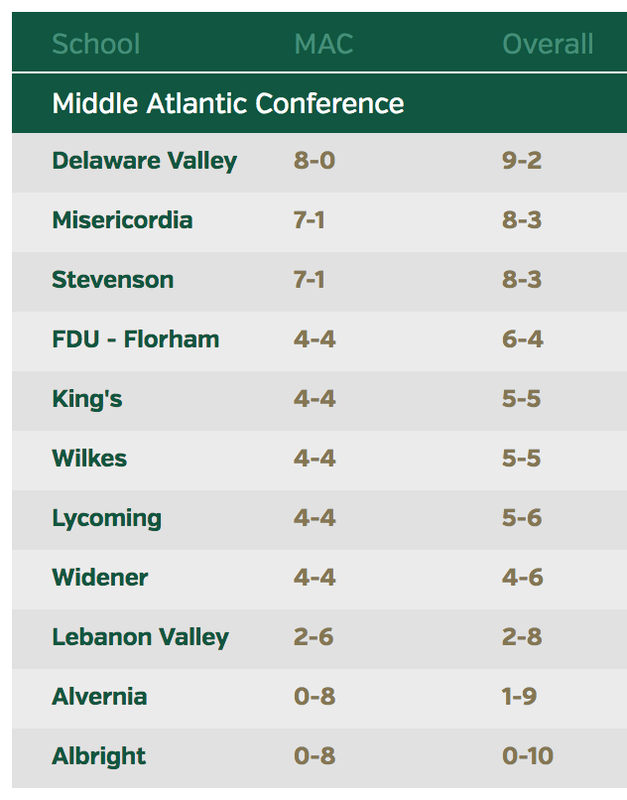 It tells you the latest happenings in the Middle Atlantic Conference posted to the www.MACfb.com site.